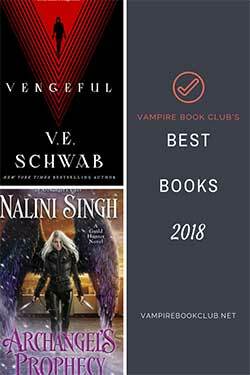 Note: While this review will be spoiler free it will reference previous books. If you haven’t started this series, check out VBC’s review of book 1, Getting Wilde. After figuring out the Connected are under threat from a group called SANCTUS, Sara Wilde and those in the Arcane Council are anticipating an attack to come sooner rather than later. Sara, for her part, is taking on more jobs, earning more money and trying to help Father Jerome house the ever increasing Connected that come to him for safe haven. These jobs also keep Sara out of Vegas, which is a big check in the plus column. But with her oracular obligations to the High Priestess and at the constant nagging of Armaeus Bertrand (aka The Magician), her respite is short-lived. When she does return, Sara is put in the service of the Council once again. This time it’s acquiring a set of scrolls that will be featured at an upcoming antiquities gala. These scrolls are thought to contain unimaginable power, and will certainly help with the fight against SANCTUS. Now, if only blast-from-her-past Detective Brody Rooks wasn’t watching Sara’s every move, maybe this job would go off without a hitch. Getting Wilde was a great surprise to me when it was released a few months ago. 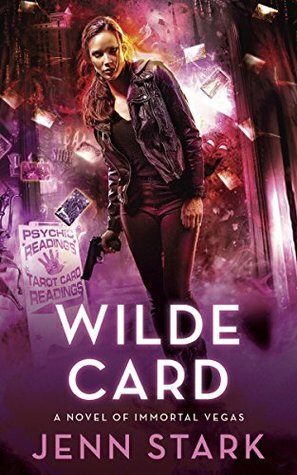 Wilde Card continues on in the same vein, only I think being familiar with the characters and setting, and knowing what to expect with Sara’s often zany antics makes this one a better read. There’s still a lot of mystery surrounding Sara’s power, and I’m ok with not getting the answers right away. 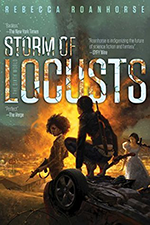 I enjoyed seeing new things unfold, but I suppose the caveat with that is when all is finally revealed it better be spectacular—and with the way things have gone in these first two books, I have no fear that Jenn Stark will deliver. Surprisingly, I’m also not turned-off by the potential love triangle between Sara, Armaeus and Brody. It’s amped up in Wilde Card due to the fact that Brody and Sara reunited later on in Getting Wilde. Like Sara’s feelings for The Magician, she doesn’t really know what game Brody is playing. She’s smart enough to know that some of the emotions she feels towards him resonate from the crush she harbored when they worked together years ago. I like the history between them, but there’s still no denying the chemistry between Sara and Armaeus. I’m happy to report that, while still retaining his mysteriousness, Sara and Armaeus spend a lot more time together in this book, and despite her protestations about his controlling ways, it’s clear she feels something for him. What exactly that ‘something’ is, I suppose time will tell. Jenn Stark introduced a couple other members of the Arcane Council: The Empress (Roxie) and The Fool (Simon). Simon was by far my favorite addition. He’s somewhat new to his role of The Fool and it was nice to see a Council member who wasn’t all omnipresent and was still getting to know the ins and outs of his own powers. It brought out a more humane side to the Council. If you haven’t checked this series out yet, I highly recommend it. Anyone who likes a strong, wise-cracking heroine and some delicious chemistry will find a lot to love about this series.